A simple introduction to the charm, magic, and versatility of the guitar leaves a huge impression on many people. Quickly, the guitar can become your forever friend... and a lifelong passion. Where are the Lessons available? Mount Uniacke District and neighbouring communities, including Middle and Upper Sackville, Lakelands, Ardoise, Ellershouse, Hillsvale, and South Rawdon. Venue: In my home (Mount Uniacke), or in yours. Approach: One-on-one lessons. You'll be up and playing some basic songs right away. You'll get an immediate sense of "Yes, I can do this!" I'll add foundation and structure to your music gradually, at a pace you choose to learn. 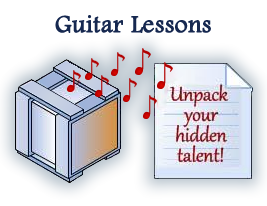 Custom-tailored: I'll set up your personal lessons so they match the guitar styles and songs you would like to learn. Ages: All ages. Seniors welcome! Learning guitar is not just for the young – it's also for the young at heart. It's never too late to start a new pastime. To request more information, contact me through this site.